For ranking 49 nationally for specialty of pediatric orthopedics. Dell Children’s is the only Level I Pediatric Trauma Center in Central Texas and one of only five in all of Texas. This certification indicates the highest level of care available. Our facility was re-verified in 2015. Dell Children’s was recognized for healing power of a truly engaging atmosphere by Masters of Health Administration Online. Dell Children’s was recognized for outstanding performance in the Water, Energy, and Green Building categories awarded by Practice Greenhealth. The Austin Business Journal recognized the positive impact of the W.H. and Elaine McCarty South Tower at Dell Children’s during its annual 2015 Commercial Real Estate Awards. Dell Children’s was featured in “The Energy And Green Building Issue – Green From The Ground Up” in Becker’s Hospital Report. Our Outpatient Diagnostic Laboratory earned a 5-Star Award for Patient Experience from the Professional Research Consultants. 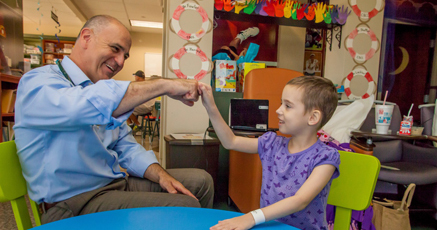 Dell Children’s was in the top 50 on U.S. News and World Report’s annual list. The Joint Commission recognized us for excellence in this service line. The recognition is based on data reported in the previous year about evidence-based clinical processes for children’s asthma. Dell Children’s received this award from the U.S. Department of Health and Human Services (HHS) for successful efforts in organ donation and donor registration. Our Anesthesia Services received a 4-Star Award for Physician Engagement, while our Outpatient Services and Emergency Department Services received 4-Star Awards for Patient Experience. All recognitions were from the Professional Research Consultants. Our Injury Prevention Program was recognized by Safe States Alliance for their commitment to the field of injury and violence prevention and use of innovative approach to maintain or grow program infrastructure. This is one of the association’s most prestigious awards. The U.S. Department of Energy’s Better Buildings Challenge Summit in Washington, D.C. recognized Dell Children’s Medical Center for its reduced energy consumption in a recent expansion of the hospital complex. This award is given by the Texas EMS for Children Program to a team that has displayed outstanding care for a child in an emergency medical or trauma event. The Dell Children’s Medical Center Emergency Department Staff and Trauma Services were recognized for the coordinated care and service provided to this child. U.S. Green Building Council honored the W.H. and Elaine McCarthy South Tower at Dell Children’s with this award. Dell Children’s Medical Center was recognized by Austin Energy for excellence in following sustainable building practices in design and construction. This was the first commercial project to receive the distinction. Magnet Designation is the highest recognition of excellence in the nation awarded by the American Nurses Credentialing Center. The Cystic Fibrosis Foundation recognized Dell Children’s pediatric programs that offer the highest level of care, education and support as well as clinical research. The U.S. Green Building Council recognized Dell Children’s for vision, leadership and commitment to the evolution of green building design and construction. The Texas Department of State Health Services recognized Dell Children’s along with University Medical Center at Brackenridge. Greater Austin Hispanic Chamber of Commerce gave Dell Children’s this award for our Spanish interpreter program. The Austin NAACP gave Dell Children’s this award for supporting children’s health care needs. Dell Children’s Medical Center was honored by the U.S. Green Building Council as the world’s first hospital to receive Leadership in Energy & Environmental Design Platinum Certification, the highest achievement bestowed for the design, construction and operation of high-performance green buildings. Dell Children’s received this award from the National Air Filtration Association. The purpose of the award is to recognize leadership and excellence in air filtration by selected air filter users.